EXHIBITED: Salford, The Lowry, February 2009 - July 2011 Lowry executed Swinbury Station in 1939 which was also the year of his mother's death. The picture shows a busy crowd of figures beginning their journey to the Bramleigh v Swinbury football match, which is advertised on the platform and would have been the afternoon's entertainment. Both Bramleigh and Swinbury appear to be semi-imagined locations in the North West which would not be unusual. Lowry is well known for his fantastical compositions which rarely depict a specific place but are amalgamations of different areas and buildings with which he has become intimately acquainted. Swinbury Station shows that Lowry was not just an illustrator of the industrial landscape, even though the factories and mills that he has become so associated with are made subtly apparent in the background of the composition. Lowry was an observer of all that working class life comprised and was obliged to show the routines of the weekend as well as those of the week. As a football fan, he was part of the crowd and places us the viewer at street level directly amongst the people. 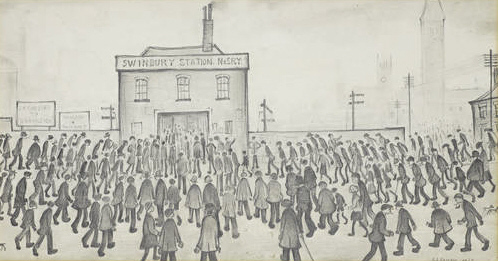 Swinbury Station is testament to Lowry's skill as a draughtsman and has never been offered for sale, having been gifted by the artist to the present owner's parents on the occasion of their engagement in 1940. It is fitting that the picture has recently been on loan at The Lowry in Salford, where it hung alongside Going to the Match, Lowry's footballing masterpiece of 1953, which was purchased by the Professional Footballers Association in 1999. The life and times of Artist L.S.Lowry. Laurence Stephen Lowry did not like to think of himself as an amateur artist. People would occassionally accuse him of being self-taught and untutored. he commented, "Started at fifteen years old. Don't know why?" My aunt said "You are no good for anything else, so you might as well go to Art School." LSLowry began evening classes in fine art and free-hand art drawing during 1905. Later studying in both the Manchester Academy of Fine Art and The Salford Royal Technical College at Peel Park. School records show that Lowry attended art classes during the 1920's. Lowry had learnt from teachers, people such as the Frenchman Adolphe Valette. This French Impressionist artist had made a big impact on the art world. He saw from exhibitions in Manchester how the current trends in modern art were changing, and had great affection for Pre-Raphaelite art, by artists such as Rossetti and Ford Madox Brown. A naive Sunday artist LS Lowry certainly was not. Lowry strove for a distinctive way of painting and drawing, and for a subject matter Lowry could make unique. Throughout the early years L.S.Lowry lived in Victoria Park, the suburbs of Manchester. Due to lack of money the family moved to Station Road, Pendlebury. There, the tree lined streets changed to factory chimneys. Lowry recalled "At first I detested it, and then, after years, became pretty interested in it, eventually obsessed by it". he saw the subjects for his paintings all around him. In Lowry's later life, L.S.L. recalled a particular event. "One day after missing a train from Pendlebury (a local town) I had ignored for seven years, and on leaving the station, saw the Acme Spinning Company's mill. The huge black framework of rows of yellow lit windows standing up against the sad, damp charged afternoon sky. The mill was turning out. "Gazing at this scene, which I'd looked at many times without seeing, with rapture." A writer in The Guardian newspaper, Bernard Taylor, recognised the unique quality of Lowry paintings, when he reviewed an early exhibition. "Mr Laurence S Lowry has a very interesting and individual outlook. Lowry subjects are Manchester and Lancashire street scenes, interpreted with technical means as yet imperfect, but with real imagination. We hear a great deal nowadays about recovering the simplicity of vision of primitives in art. These pictures are authentically primitive, the real thing not an artificially cultivated likeness to it. The problems of representation are solved not by reference to established conventions, but by sheer determination to express what the artist has felt. Whether the result is according to rule or not..."
Visit the the studio in Nottinghamshire, the largest collection of LS Lowry artist signed, limited edition prints in the UK.